An alien star has now been discovered to have an extra planet that astronomers so far cannot explain. A fourth planet has been imaged orbiting the bright, very young star HR 8799, nearly 130 light-years away. 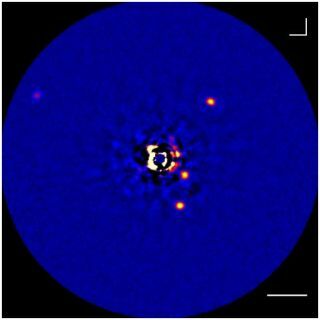 This newfound world is at least seven times the mass of Jupiter, roughly the same as a trio of other giant planets astronomers had seen circling the star two years ago in the first direct images of extrasolar planets. This fourth planet was detected in images taken over the course of 15 months at the W.M. Keck Observatory in Hawaii. Its orbit lies roughly 14.5 astronomical units (AU) away from HR 8799, or 14.5 times as far as Earth is from the sun. There are two competing theories for how worlds as large or larger than Jupiter are formed. One is a one-step process involving a rapid collapse of gas around a dense region known as a gravitational instability. The other is a two-step process ? called the core accretion model ? involving the birth of a solid core from dust, which later accretes gas around it. However, neither of these can explain how all four planets might have formed in this system and reached the orbits they have now. Gravitational instability models only work for planets more than 30 AU out, while core accretion models work for those 20 AU in, and the four worlds seen around HR 8799 range both below 20 AU and beyond 30 AU. A hybrid process with different planets originating both ways might have occurred, but the researchers said this seemed unlikely, given their similar masses and dynamics. One possible explanation for this mystery might be the star's unusually massive disk of dust. This suggests HR 8799 might have once possessed an extremely dense protoplanetary disk that could have dragged planets around. Worlds formed through gravitational instabilities might have been forced inward, while any planets born through core accretion would have scattered outward. "We still need to run the simulations to see if that can explain the current system," researcher Christian Marois, an astronomer at the National Research Council of Canada, told SPACE.com. "It is not obvious that you can drag four massive planets for tens of AUs and keep the system from ejecting a planet or two in the process." "We now hope to look more at HR 8799 to see if we can find another planet," Marois said. "We also hope to do more detailed observations on the planets to figure out more about their atmospheres, physics and chemistry. Data on another planet and more data about the planets could give hints about how they all formed, and maybe shed light on any global laws for how planets form." The scientists detailed their findings online Dec. 8 before print in the journal Nature.